Serious auto accidents, roof crushes, vehicle rollovers and dangerous blowouts can occur as a direct result of defective tires. Recognizing early signs of faulty tires can mean the difference between life and death, especially considering that more than 3 million defective tires have been recalled by manufacturers in recent years. In 2014 alone, premature tire failure caused by design and manufacturing defects was blamed for at least 42 injuries and 12 deaths in the U.S. Despite global tire recalls initiated by Goodyear, Firestone and other leading companies, a new report by safety officials estimates that less than 20 percent have been returned by customers. Louisiana defective tire lawyer Bart Bernard offers legal guidance to motorists who were harmed in accidents caused by sidewall defects, sudden detreading and other problems attributed to negligence. Boasting decades of product recall experience, Bart is well-versed in procuring compelling evidence and establishing liability, ensuring victims achieve justice for their losses. Unfortunately, officials at the National Transportation Safety Board (NTSB) caution that the recall system intended to keep defective and dangerous tires off the nation’s roadways is “completely broken.” The alarming reality is that there is no government-run database that alerts consumers or tire dealers about known problems or recalls, which has prompted Congress to push for stricter rules mandating tire registration. Recognizing and diagnosing tire problems is not always easy for vehicle owners. In some situations, the defects are obvious, whereas others are internal and best observed by a mechanic. To avoid accidents or blowouts, always check your tires regularly and ensure they are properly inflated. Was My Accident Caused by Defective Tires? There are multiple causes of tire failure car accidents caused by manufacturing flaws. A skilled attorney will marshal evidence to support a product liability lawsuit that alleges design defects; faulty components; non-compliance with good manufacturing practices; negligent craftsmanship and other causes of action. Tire manufacturers, like all producers of consumer goods, are required by law to conduct rigorous pre-market tests to ensure the safety of their products for their intended purpose. If defects are discovered, these companies are also obliged to notify the public and distributors, to help prevent injuries and accidents. When tire defects go unreported or recalls aren’t issued, victims and their loved ones may be entitled to legal compensation. Can I Sue If a Tire Blowout Caused My Auto Accident? Tire explosion accidents often result in total loss of vehicle control, leading to catastrophic injuries. Take the case of Joan Morro, a South Carolina woman who was killed in 2014 after a defective tire on her pickup truck blew, sending her Dodge off the busy interstate highway. Her husband, who was also in the truck, suffered multiple skull fractures and brain injury. Last year, their son took his grievances to court, claiming that the deadly tire accident was a direct result of a Michelin tire that had been recalled. Michelin had recalled the tires due to risks of tread separation earlier that year. Will my car insurance cover a tire blowout? This depends on the type of vehicle coverage purchased. Basic liability insurance will not cover damage or injury caused by a tire blowout, but comprehensive insurance usually does. Comprehensive auto insurance is designed to cover for damages related to theft, flood, fire, vandalism or some other unavoidable act of nature. Tire blowout accident statistics released by the NTSB show that an astonishing 78,000 wrecks happen in the United States every year due to blowouts. 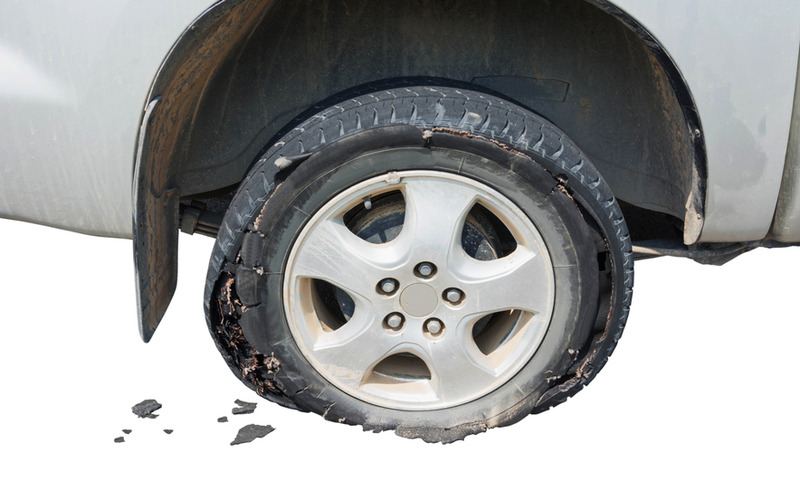 Another 11,000 car crashes each year are attributed to tire failure. By inspecting tires at least once a month for bulges, gouges, uneven tread and other tell-tale signs of defects, motorists can avoid the risk of having a tire blowout. Also keep in mind that tires have an average lifespan of six years. An estimated 400 to 500 fatalities are attributed to tire blowouts or failures every year in the United States. At present, there is no centralized database that lists all tire recalls issued in the United States. For now, the fastest way to verify if your tires were recalled is to call the manufacturer directly. Goodyear recalls G399A LHS tires manufactured from January 2016 through May 2016 due to improper adhesion and tread separation risks. Hankook recalls passenger vehicle tires manufactured from May 2013 through February 2015 due to potential cracks in the sidewall that may cause early failure. The recalled tires include Ventus S1 Noble2 245/45R18 96W, 245/40R19 94W, 275/35R19 96W. Michelin recalls LTX M/S tires, manufactured from January 2010 until June 2012 because of the danger of thread separation. Firestone recalls FR380 tires made from September 9, 2007 through July 2, 2008 due to manufacturing defects that can cause groove cracking, detreading and loss of vehicle control. Why Call a Tire Defect Lawyer? Louisiana attorney Bart Bernard is dedicated to aggressively defending the rights of individuals harmed by defective and dangerous products. Bart is not only an experienced legal advocate who works with medical experts, investigators and seasoned accident reconstructionists, he is with you every step of the way with kind, compassionate support. Get the compensation you deserve after a serious tire accident. Call our Baton Rouge, Lake Charles or Lafayette offices for a private consultation at no charge. Call anytime, 24/7.